So you got your dress. You’ve got your reception venue and you know how much you will be paying for food and drinks. There’s a good chance that the bill for your wedding is already tallying up to quite a bit at this point. This is usually where brides begin scrambling to try and cut corners and save a bit of extra cash. Believe it or not, but there are websites that will allow you to create an entire wedding website that will advertise your wedding details FOR FREE and allow you to send out a personalized invitation as well. These websites will allow you to usually upload a certain amount of personal photos of you, or your groom, or you both together, and include an mp3 of a song that helps define you as a couple. These websites usually also allow for you to include some sort of invitation emailing component. If most of your wedding guests are computer savvy, then this is definitely the way to go. If there are some of your guests who are not so computer savvy (think grandparents, aunts and uncles) then you can limit the amount of printed invitations to just them. 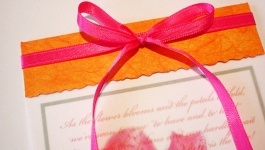 There’s quite a wide array of different costs when it comes to printed invitations. If you go to a wedding stationary store, you are surely to find a lot of wedding invitation prices that seem border line insane. If you are not happy with those prices, give other stationary store chains that do not specialize in wedding invitations alone a try. This means visiting craft stores such as Michaels or other stores such as Staples and Kinkos a try. A lot of wholesale warehouse types of stores also have special deals on wedding invitation prints available, so take advantage of those. So you always wanted that engraved and elegant wedding invitation. Though these are indeed beautiful, they are indeed expensive and will leave your pocket book crying at the end of the day. Consider Thermography which will give your lettering the same sort of raised look or less money, or consider simply having the information laser printed onto the wedding itself to really save a lot of money. This type of print is appropriate for any type of wedding. Buying into a package almost always means that you’re saving money – as long as you need what’s in the package. Discount packages are a great way to go if you need to buy your invitations in bulk, or if you need to add additional items to your invitations (such as place cards and/or thank you cards). Envelops are also often included as well, or are thrown in a”freebie” or as a thank you for ordering all of your wedding stationary through one company. What should I Include in my RSVP Cards?